In this report, we look into what it takes to reach comparably sized audiences across different media like television, print, online and mobile apps. 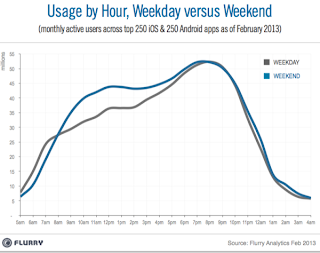 We also drill down into how the size and engagement of the mobile app audience varies across days of the week and hours of the day, and how it presents unique opportunities. 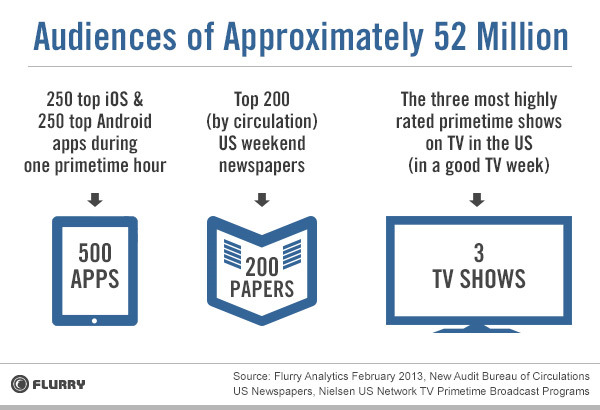 Let’s start by considering when people use apps. Comparing weekday to weekend curves, the general shape is similar. App usage ebbs overnight and then grows throughout the day, peaking in the early evening. While weekends also have a distinct primetime window, they see higher daytime usage across the day between 9:00 AM – 5:00 PM, ostensibly when someone would normally be working. However, the overall difference in audience size during the day between weekdays and weekends is not substantially different. Let’s look at 11:00 AM, for example, when the number of people using apps varies the most between weekdays and weekends. The size of the audience during this time is only 25% greater on weekends. Looking at it another way, this means that during the normal workday, people use apps at least 75% as much as they do on weekends. This creates a unique opportunity for advertisers to reach desired audiences over the course of the day via mobile. Now, let’s return to that 52 million primetime app user number. 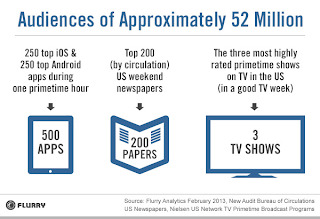 To get to an audience of that size, you’d need to combine the circulation of the largest 200 weekend newspapers in the U.S. or combine the audiences for the 3 most highly rated primetime TV shows during a good TV week (e.g., The Big Bang Theory).